Info "Pop him when his guard drops!" Urban Champ is one of 9-Volt's microgames in WarioWare: D.I.Y. This microgame is based on the video game Urban Champion. 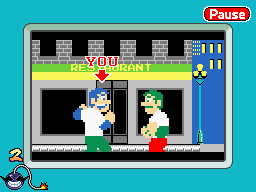 To win the game, the player has to make the blue haired man punch his opponent. To do so, they have to tap anywhere on the stage when the green haired man's guard is down. If done so, the game is won. However, if time's up and the opponent isn't down, the player loses the microgame. This page was last edited on July 19, 2018, at 20:01.